We interrupt these somewhat regular posts of late to bring you a guest post all the way from San Francisco! Introducing the wonderful Angi from Rice & Wheat! Angi & I first met through Project Food Blog last year but we really bonded over our infamous muffcakes, a bad word “created” on Twitter and made delicious by ourselves and three other blogger buddies. When I was in San Francisco I had the immense pleasure of hanging out with Angi, her hubs Nathan and her kitty Toro and a kinder soul, whom I have bonded with instantly, I have never met; of course I asked her to do a guest for me. Not only did she agree wholeheartedly, she sent over this incredible looking trifle! 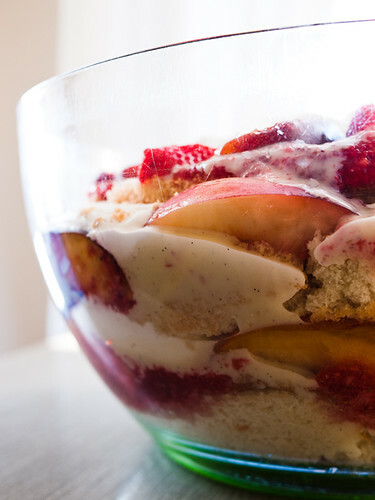 So enough from me, let’s get to Angi and her trifle or, more specifically, her version of San Francisco’s Tartine Bakery’s trifle – yum. Thanks Angi! When Jackie asked me to do a guest post here on I Am a Feeder, it didn’t take me long to decide to make a trifle because after all, doesn’t it just seemed appropriate to make my favorite British dessert for my favorite British blogger?? But hehe, I have to admit I also had an ulterior motive in mind. You see, I’ve had my eye on the trifle recipe from the Tartine cookbook for a while and well, just needed the perfect excuse to test it out. So… thank you Jackie! But hey, Jackie and I totally had lunch at Tartine when she came to visit San Francisco, so it’s totally 100% appropriate, don’t you think? The making of a trifle seems complicated but if you do some of the steps ahead of time, it honestly isn’t bad at all. I highly recommend making the pastry cream and the chiffon cake a few days before you want to serve the trifle. The amount of time the chiffon cake is in the oven is just about the perfect amount of time to make the pastry cream. But really, you can even make them on separate days if you want. The berry puree can also be made ahead of time, either a day before or the morning of. Then when you’re ready to put it all together, all you really have to do is slice the cake, make the whipped cream, and assemble the trifle. Oh, and no trifle bowl? No worries! I just used the bottom part of a salad spinner but any large clear bowl will work. If you don’t have a clear bowl, any large bowl is fine too. Believe me, you and your friends will forget all about not seeing the layers once you start eating. Adapted from the Tartine Bakery Cookbook. 1. Preheat oven to 325 degrees F / 160 degrees C. Line the bottom of a 10-inch springform pan with a parchment paper circle but don’t grease the sides of the pan! 2. Separate the eggs – put 6 of the yolks in a small bowl and all 10 whites in a large bowl (save the leftover 4 yolks for the pastry cream below). In the bowl with the yolks, add in the oil, water, vanilla, and lemon zest. Whisk to combine. 3. 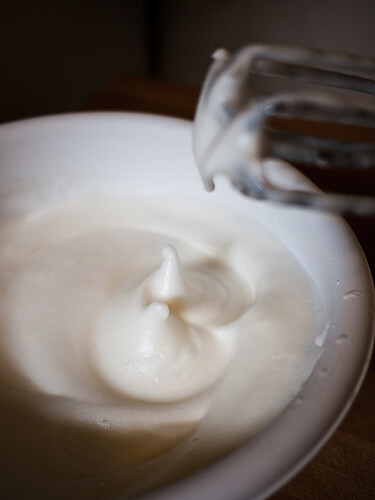 In the large bowl with the egg whites, add the cream of tartar and whisk the whites until they hold soft peaks. Slowly add in 1/4 cup (50 g) of sugar while beating. You want the whites to hold firm peaks (photo shows where I stopped – I probably could have whisked even a little more). Set aside. 4. In a big bowl, sift together the flour and baking powder. Whisk in 1 1/4 cups (250 g) of sugar and the salt. Make a well in the middle and pour in the liquid yolk mixture. Whisk well for about a minute until very smooth. 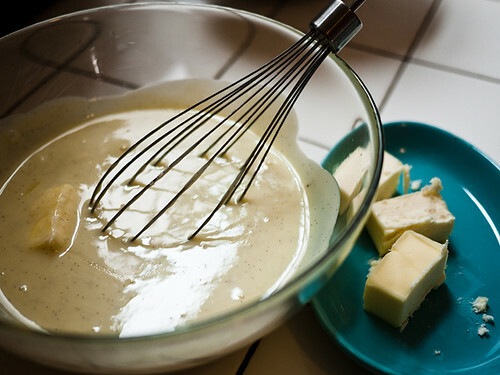 Using a rubber spatula, add in about a third of the egg whites mixture and fold gently to incorporate and lighten the batter. Add in the rest of the white and fold even more gently. Don’t go too crazy and deflate all the air in the egg whites! 5. Pour the batter into the prepared pan. Bake until a toothpick or chopstick inserted into the center comes out clean, about 50-55 mins. Let cool in the pan on a wire rack. Once cool, wrap it well with foil and store in the fridge until you’re ready to use. It’ll be good for a few days. 1. Prepare a bowl for cooling the pastry cream. Set a fine-mesh sieve resting on the rim. 2. In a bowl, whisk together the cornstarch and the sugar. Add the egg yolks and whisk until smooth. Set aside. 3. Put the milk into a heavy saucepan. Split the vanilla bean in half and scrape the seeds. Add the seeds and the salt to the milk. Turn the stove to medium and heat the milk until just before boiling, stirring frequently. Be careful here because you do not want to burn the milk. I would err on the side of a lower heat on the stove, especially if you plan to walk away from it every so often. 4. Once the milk is hot and you’re ready for some quality time at the stove (no walking away! ), carefully ladle in about a third of the milk into the egg mixture and keep whisking. You want to temper the egg mixture but don’t want scrambled eggs! Once you’ve whisked in that bit of milk into the egg, pour the entire milk+egg mixture back with the rest of the milk in saucepan. 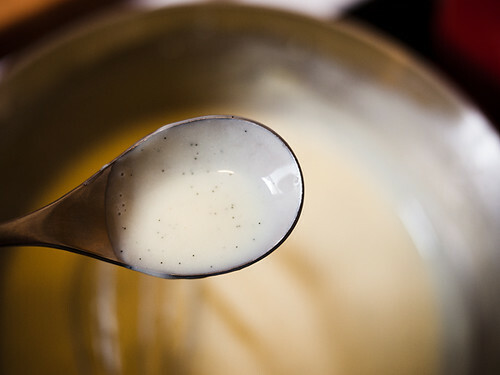 Keep the heat at medium and keep whisking until you have thickened the custard. But don’t let the custard boil or the pastry cream will curdle! (Top photo shows the thickness at which I stopped). 5. Remove from heat and immediately pour through the sieve into the cooling bowl. Let the custard cool in the bowl for 10 min. Stir it occasionally so it doesn’t develop a film on top. Once it’s cooled for about 10 min, add in the butter, 1 tbsp / 14 g at a time, and whisk after each addition until butter is completely melted and incorporated. 6. Cover the bowl with plastic wrap, pressing the film right on the surface of the pastry cream. Keep in the fridge until you’re ready to assemble the trifle. It’ll be good for a few days. 1. In a blender or food processor, combine the berries and sugar. Puree until smooth. You can strain the puree if you want to go all fancy, but I like rustic things (and I’m lazy), so I just leave the seeds in the puree. If you’re using wine, stir it in. Puree is now ready for its trifle-y fate or you can store this in the fridge for a day or two. Assemble the Trifle – Finally! 2. In a large mixing bowl, whip the cream with the sugar until it holds soft peaks. Set aside. 3. Now you’re ready to assemble the trifle. Start with a layer of cake at the bottom – cut it however you need to fit it into the bottom of the bowl. Pour in a third of the puree and spread it all around – it’ll soak into the cake as it sits. Top with a third of the sliced fruits. Spoon half of the pastry cream over the fruit and a third of the whipped cream. Put down the second layer of cake. Pour in half of the leftover puree and spread it around again. Top with half of the rest of the fruit, all the rest of the pastry cream, and half of the leftover whipped cream. Put down the final layer of cake. Spread the rest of the puree over the top. 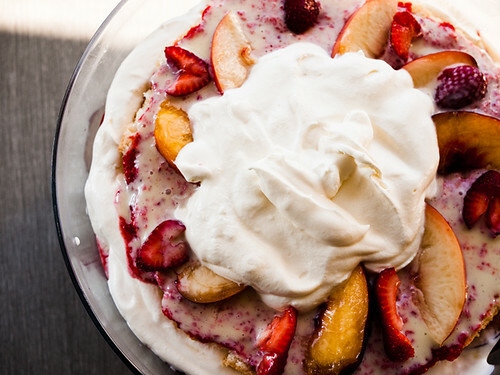 Decorate with the rest of the fruit and whipped cream. 4. Wrap the trifle and chill in the fridge before serving. It’ll keep for about a day. A huge thanks to Angi once again for her gorgeous trifle – glad I could give you a reason to make it! Be sure to follow her on Twitter and subscribe to her blog! She’s constantly making me feel very jealous that I don’t live in San Francisco and that we can’t play with food together… I guess I’ll just have to continue living vicariously through her, and you should too! 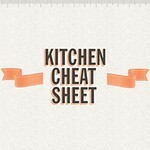 That’s all for now, be sure to check back next week for more, including some very easy recipes from moi. I apparently regularly post these days on Mondays & Fridays so set your diaries, your Readers, your schedules, whatever you’ve got! Until next time, peace and love. When I made the only trifle I have ever made, I cheated and used pound cake. But I prided myself on making my own custard (it was all a Nigella Lawson recipe, so it felt authentic) and I remember wanting it to come together for our party the next night SO MUCH. It did, but it was stress-inducing. I salute you for making your own cake. Oh dear. That’s gorgeous. I’ve never had trifle before. It was always such a grand, foreign thing to me. It looks so luscious…awesome job making everything from scratch! Well, whisking was certainly a theme in making this yesterday. Thank goodness for my kitchenaid mixer for whipping the egg whites! It turned out great overall, but the cake definitely baked up much higher than I thought it would (maybe the altitude here). Overall, delicious and a huge hit with our company!